Buíochas ó chroí do chuile dhuine a d’fhreastal ar an Oíche BYOB ar son Phádraig oíche Aoine. Bhí Club an Chonradh dubh le daoine, agus ó seanchairde go tacaitheoirí nua, tháinig gach éinne le chéile don ardfhear é féin. Gan aon agó beidh Pádraig ar buile gur chaill sé amach ar oíche den chéad scoth sa Chonradh, ach mar sin féin bhí a láithreachas le brath ag chuile dhuine ann. San iomlán, leis an gcrannchur fíor-shiamsúil san áireamh, bailíodh €4,277.70 le tús dochreidte spleodrach a chuir leis an tiomsú airgid ar son Phádraig. Míle buíochas arís don 250+ duine a d’fhreastal ar an oíche agus do gach éinne nach raibh ábalta teacht ach a thug tabhartas flaithiúil. Caidé mar thús! Caidé mar oíche! 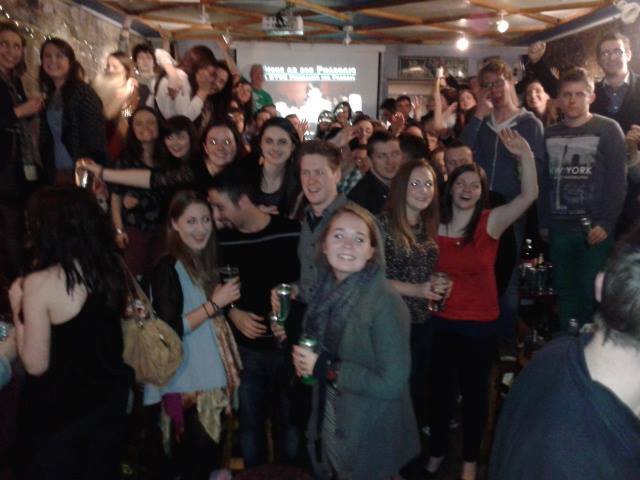 Heartfelt thanks to all those who attended Friday night’s BYOB in Club an Chonradh. The bar was packed from wall to well with old friends, new supporters, and everyone else in between who came together for the big man himself. No doubt Pádraig will be raging to have missed out on such a great night but still his presence was felt by all who attended. The event, ever-entertaining raffle included, raised a whopping €4,277.70 to kickstart the fundraising on what was a very memorable evening. Thanks again to the 250+ people who showed their support on the night and also to those who could not attend but made a generous donation. What a start! What a night! This entry was posted in Uncategorized and tagged Pádraig, Phádraig on December 8, 2013 by ReinhardSchaler.